Serving up a feast of Chicago sports: "May I ask you for a moment of silence…for last week's game?" 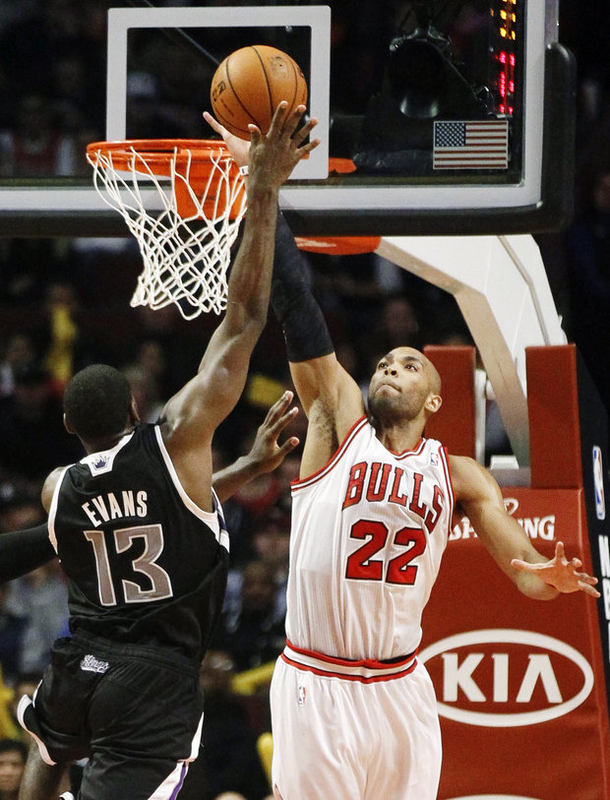 Taj Gibson not only wins on Wednesday-gets a new contract. Taj Gibson got a win and a new contract Opening Night. - No Rose-no problem for the Bulls Opener; it was just one game and it was Sacramento. It was rough watching the opening video of the team just before the intros and seeing flashes of Rose, a painful reminder to the fans and his teammates. Off the court, the team and Taj Gibson did get a deal done just before the 11pm deadline on Halloween. Gibson signed a four year deal worth $38 million. As Gibson was talking about it in the locker room, his teammates were yelling at him that the big contract meant he was buying dinner. - Wednesday night was also a MLS playoff night for the Chicago Fire, they fell 2-1 to Will Bruin and the Houston Dynamo. Bruin tallied both goals. And I was thinking about covering their next game…next year. - White Sox General Manager Rick Hahn (strange to have a new GM) is already making noise, and it seems to be directed at the Detroit Tigers and the AL Central division-they are going to compete with them next year. By re-signing Jake Peavy to a two year and an option for the $29 million plus and picking up Gavin Floyd&apos;s $9.5 million, this team has secure their starting rotation. They also have good news on pitcher John Danks; the lefty is throwing weeks after his surgery. Not at all surprised the Sox didn’t pick up the options on third baseman Kevin Youkilis and reliever Brett Myers. That was $23 million that would have bloated the payroll. Unless they find difficulties with free agency...it was nice knowing you. That brings me to the one free agent that filed and will be testing the market: A.J. Pierzynski. In all likelihood, the Sox catcher is gone. He will be getting some decent contract offers. If A.J. leaves there will be only one player left from the World Series team: Paul Konerko. - Kudos to Peavy and Cubs second baseman Darwin Barney, both won the Rawlings Gold Glove for their defense. We were used to Mark Buehrle winning that honor for the Southsiders. Buehrle did win it in the National League. The real story is Barney, it has been a long time for a Cub second baseman to earn that honor; Ryne Sandberg was a fixture for it. I spoke with Darwin from his home in Oregon. He said Sandberg helped him when Ryne was his minor league manager. One of the few bright spots for the Cubs this dreadful season was the 141 errorless games streak by Barney. He told me it wasn&apos;t hard physically, but tough mentally. “There were times when it was tough, it was on your mind all the time," said Barney. It was also treated like a no-hitter; no one wanted to jinx it so it was not talked about. Darwin said it was “uplifting” during a tough season. Maybe now the Cubs management will consider him a core player. - Anyone interested in seeing Patrick Kane play hockey in Switzerland? You don’t think the Blackhawk brain trust is squirming a little bit with this development? There will be more players leaving as the NHL lockout continues. The league is now making rumblings of cancelling the “Winter Classic” between Detroit and Toronto, scheduled January 1st at the University of Michigan in Ann Arbor. That is over one-hundred thousand seats to refund and big network dollars lost. - Rack up another Bears honor: Cornerback Charles Tillman was named Defensive Player of the Month. He is having an incredible season. - And finally some college football: love them or hate them, an undefeated 8-0 Notre Dame team-third in the BCS rankings and a competitive 7-2 Northwestern team is always good for Chicago. While the Wildcats take the week off, The Irish are hosting Pittsburgh. Have you ever watched head coach Brian Kelly on the sidelines or hear one of his press conferences? He is as wound up as you ever want to see in a coach. Obviously, Kelly is getting his message across and making ND very relevant for a shot at the National Championship. If you are a sports fan and love to see cool venues, I highly recommend a trip to South Bend. Seeing an Irish home game is really a terrific experience--even if you don’t like Notre Dame.